Folklore erroneously claims verification consumes 70% of development time. But does debug really consume 50%? There have been a number of times when anecdotal evidence became folk law and then over time, the effort was put in to find out whether there was any truth in it. Perhaps the most famous case is the statement that verification consumes 70% of development time and resources. For years this “fact” was used in almost every verification presentation and yet nobody knew where the number had come from. All development teams are different, and even though this was a mean figure nobody attempted to come up with a definitive answer. In 2007, Mentor Graphics began a series of studies, first using the help of Far West Research and from 2010 onwards using the Wilson Research Group, and the truth became known. In 2007 it was not true. 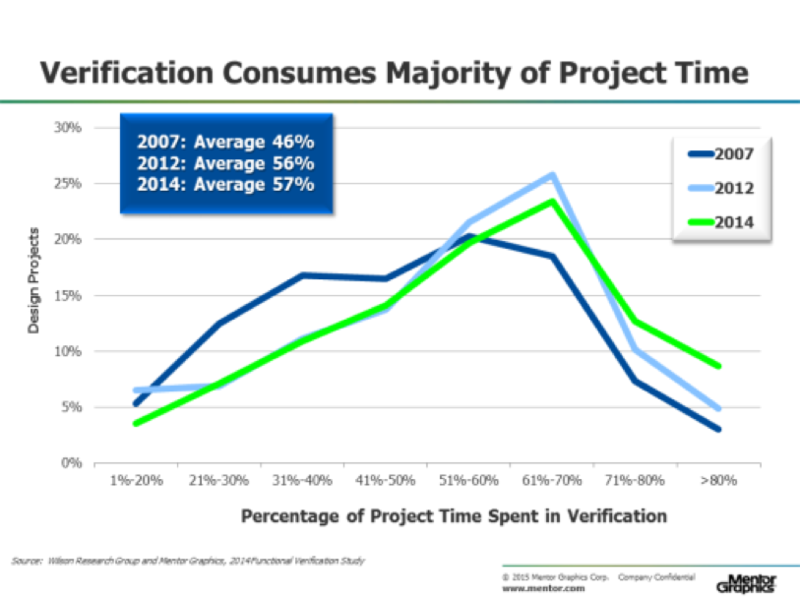 Verification consumed only 46% of development time according to the survey results. It is not true today. While it has been increasing and today stands at around 57% that has not stopped most papers and presentations from using the fictitious number of 70%. However, it may be true that the most advanced designs are somewhere around this figure because 70% is correct for about 20% of the industry. Another often-stated “fact” is that debug consumes 50% of development time. Semiconductor Engineering wanted to know if this is true, what the trends are, and what is happening in terms of development of debug tools that can change this figure in the future. Even though verification engineers are spending roughly the same percentage of time in debug, Foster believes debug is growing due to today’s increased requirements. A second set of issues is that debug cannot exist at a single level of abstraction. Looking at signal waveforms may be good for some classes of problems, but other problems do not show up until the full application software is running on the complete hardware system. At this point, the system cannot be run in a software simulator, and probably not even an emulator. Prototypes may be the only way to get enough reach into the system to be able to exercise the problem. Capturing traces at this stage may present so much data that the analysis problem becomes untenable, as well as causing a host of other problems. Specialized hardware that peeks into the functionality or performance of the system may become necessary to be able to get a clear picture of what is going on. An additional problem is that the data required for debug may be different for each of those concerns. Recently Mentor and Ansys announced an API that would allow power information to be transferred from an emulator to a power analysis tool without requiring the traditional intervening step of writing the trace data out to a file.